Top end Q5 most likely with the 317PS 3.0-litre TDI engine to come to India, 0-100kph in 5.1 seconds! Audi is going to display the range topping Q5 variant, called the SQ5 from it’s ‘S’ line of cars at the 2014 Indian Auto Expo. Don’t mistake it for the Q5 version of the Q3S which is an entry-level Q3 variant. 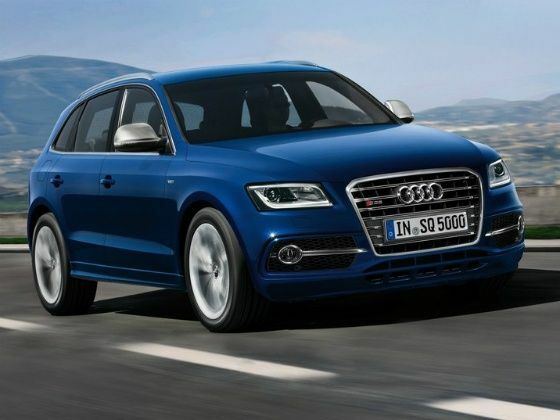 The SQ5 internationally comes with a 3.0-litre twin-turbo V6 diesel engine and a 3.0-litre TFSI petrol engine. Considering our bias for diesels, we think the former will be showcased at the Expo. It develops 317 PS of power and an insane 650Nm of torque, that’s more than 70 PS of power over the ‘standard’ Q5 3.0 TDI. This has been achieved by increasing cooling of the cylinder heads and changing the control times and strokes of the intake camshafts and also the pistons have been adapted for the higher performance. These few tricks to the engine help the SQ5 reach a blisteringly quick time of 5.1 seconds to the 100 mark from standstill and a top speed of 250 Kmph. The SQ5 rides 30mm lower than the Q5 and also has stiffer springs and dampers. It comes fitted with 255/45 tires fitted to 20-inch wheels. The SQ5’s 3.0-litre TDI engine comes mated to the 8-speed tiptronic gearbox to pass all that power to the wheels. The Q5 has been on sale in India for over five years and has taken a backseat to the larger Q7. Maybe that extra spring in the SQ5’s stride is all this SUV needs to shine through.